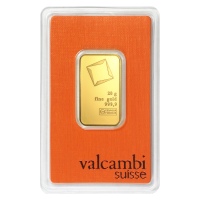 20 gram Valcambi Gold Bar We’ll offer you the best price on the web, when you order your 20 Gram Valcambi gold bar from our online store now. These minimalist, fine gold bars have been produced by the renowned, Valcambi boutique refinery, with only the most discerning investor in mind. Each bespoke bar features the trusted, Valcambi logo, centrally placed in the top half of the obverse. Also on the obverse, below and to the logo’s right, are all necessary details of metal purity, weight and content. Exceeding the minimalist elegance of the obverse, the reverse features only the Valcambi Suisse stamp. The reverse feature is flawlessly stamped down the length of the reverse, on the right hand side. Swiss refining extraordinaires, Valcambi have 56 years of sound experience behind their name… a name which has become synonymous with refining excellence and truly immaculate finishing. Experience perfection and fortify your holdings with a 20 Gram Valcambi gold bar today.